If the ball coupling is not installed and secured correctly it can become detached while the vehicle is in motion and fall onto the road. There is a risk of accident and injury. 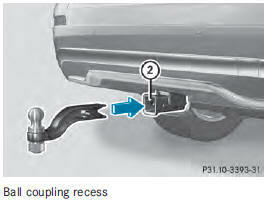 If the ball coupling is not installed and secured correctly the trailer may come loose. There is a risk of an accident. Install and secure the ball coupling as described in the ball coupling installation instructions. 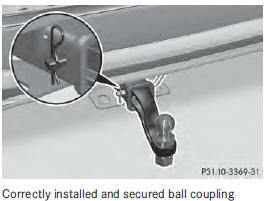 Make sure that the ball coupling is installed and secured correctly before every journey. ■ Pull protective cap 1 in the direction of the arrow, out of the ball coupling recess. ■ Place protective cap 1 in the ball coupling recess. ■ Insert the ball coupling horizontally into ball coupling recess 2 in the direction of the arrow until the holes in ball coupling 3 are in line with the holes in ball coupling recess 4. 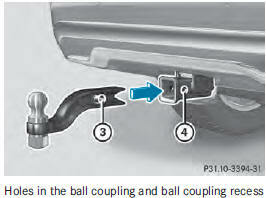 ■ Slide bolt 5 into the hole in the ball coupling recess and the ball coupling to the stop. 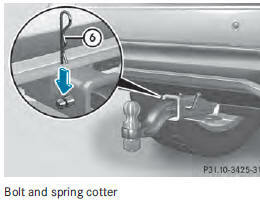 ■ Secure the bolt using spring cotter 6. ■ Check the ball coupling, bolt and spring cotter for correct installation. If the ball coupling cannot be correctly mounted, remove the ball coupling. 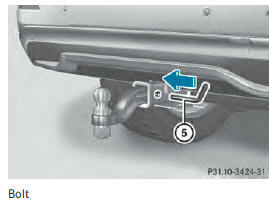 Under these circumstances, the ball coupling must not be used for trailer towing. If the ball coupling cannot be locked and the key cannot be removed, remove the ball coupling and clean it. If the ball coupling can still not be installed (locked) after it has been cleaned, remove the ball coupling. 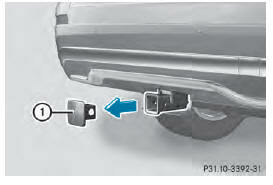 The trailer tow hitch must then not be used to tow a trailer, as safe operation cannot be guaranteed.